The brilliant Heroin in Tahiti duo is back, and it was sure worth it! They call their music “Spaghetti Wasteland”, and it’s a fitting name for what sounds like a toxic blend of exotic, spicy traditional music, and an undead glamour. 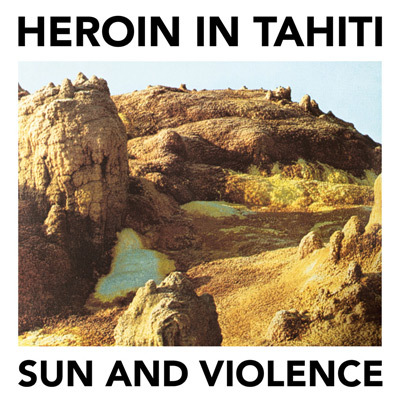 This fix of Heroin in Tahiti sends you through the twisted streets of your consciousness, scorched by a sun of eerie sound samples and beaten down by the violence of lo fi instruments. How can HIT music can be so sunny, yet so dark? To me, this is due to a paranoia-suggestive elements that hover around HIT’s music (which sounds really happy at times!) and yields something that I, as a listener, feel strangely about. The first HIT release that I have heard and written about on CINYF! Really made me eager to listen to more of this duo’s work. Well – the new album is everything I hoped for, and then more. Don’t miss this for the world.